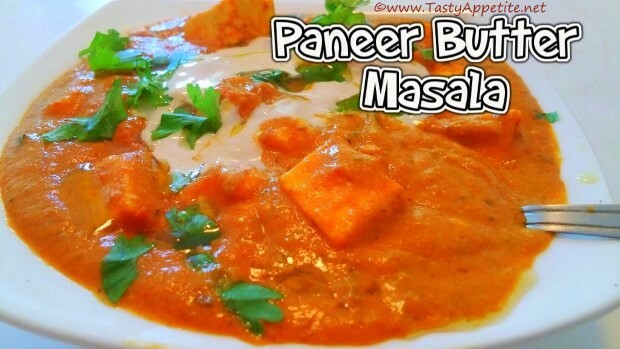 Paneer Butter Masala is one of the most popular & frequently ordered dish in any Indian restaurants. This creamy delicious masala is absolutely easy & quick to prepare at home. In this recipe the succulent chunks of paneer is cooked in a thick, spicy cashew based creamy masala. It is best served with tandoori roti, naan, paratha, phulkas and fried rice. Try this best video recipe of paneer butter masala at your home that tastes perfect & more delicious than the ones you get in hotels. Wash and cube paneer to small pieces. Set aside. Add cumin seeds and wait to splutter. Add red chilli, cloves, cardamom, cinnamon and toss. Add onions, salt and fry to transculent. Add ginger garlic paste and saute. Add tomatoes and saute until soft and cooked. Add cashew and cook for a minute. Turn off flame and allow the mixture to cool. Add to blender and grind to smooth paste. Melt 1 tbsp of butter in frypan. Add bay leaf and toss. Add red chilli pwd and fry. Add the freshly ground masala paste from blender. Add turmeric pwd, coriander pwd and garam masala pwd. Let it cook in low flame for 2 to 3 mins. Now add 1 cup of water and combine. Cook for few more minutes. Add fresh cream and combine. Add paneer cubes and simmer the flame. Cook until the masala thickens. Crush and add dried fenugreek leaves. Add a tsp of butter and turn off flame. Garnish with freshly chopped coriander leaves and fresh cream. Restaurant style rich n creamy butter paneer masala is ready. Enjoy hot with roti, paratha, chapati or any rice dishes.